While it’s not the most elaborate costume, I am participating in Halloween this year. Here’s to enjoying the spirit of Halloween! Happy Halloween! Normally, I go all out and dress up like Snow White or Joy from the movie “Inside and Out”, but this year I went simple. Just a Wonder Woman T-shirt and crown is all I can muster up. 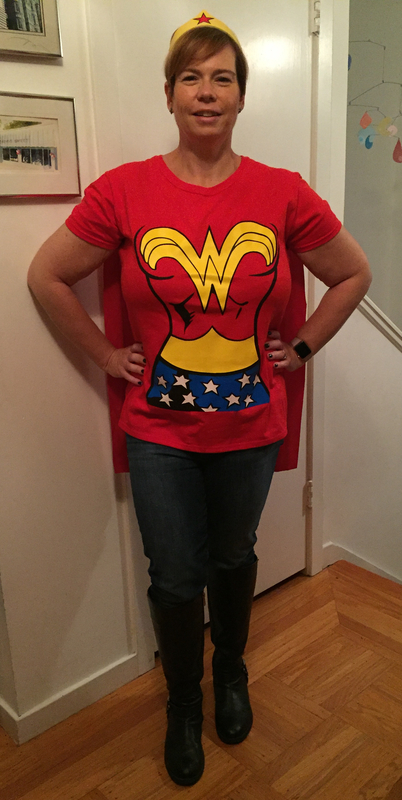 I hope that dressing like a super hero will make me feel more like one this year. Why do I want to feel like a super hero? Well, we’re in the midst of a very quick out-of-state move. It’s a very positive move, but even good change is hard. It’s difficult to say goodbye to friends, places and the “known.” We’re heading into the unknown with about two-weeks to do it and let’s just say it’s crazy! My healthy habits, both mental and physical, have fallen a bit to the way side, but not horribly so. Well, I haven’t been running, I am walking as much as possible and I’m trying to eat healthy. Although I throughly plan to indulge in some candy tonight!